"Well, for starters, you have to purify yourself in the waters of Lake Minnetonka." That quote from Prince is from Purple Rain, one of the greatest movies about music ever made. 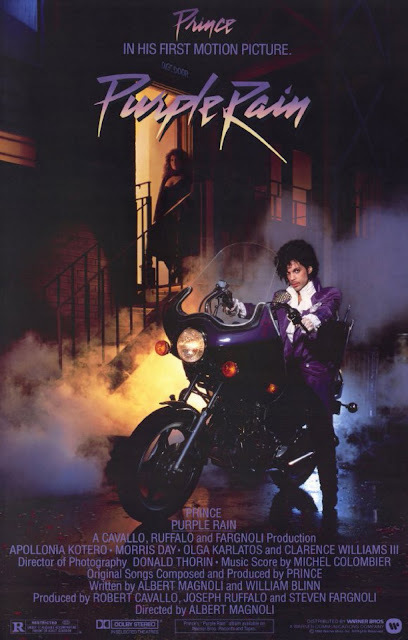 The film has been re-released in theaters after the death of Prince. Prince plays The Kid, the leader of a Minneapolis band called The Revolution. They are one of the headliners at a club called First Avenue. Their biggest rival is The Time, led by Morris (played by Morris Day). The Kid eventually finds a love interest in Apollonia (played by Apollonia Kotero), a young woman waiting to be discovered. The Kid is also battling a volatile home life, with his father (played by Clarence Williams III) being verbally & physically abusive & his mother (played by Olga Karlatos) being emotionally abusive. The Kid is also emotionally distant, refusing to play something that his bandmates, Wendy (played by Wendy Melvoin) & Lisa (played by Lisa Coleman) wrote. Eventually, fueled by Apollonia joining with Morris & his band's internal fighting, The Kid must decide to change his ways & rise past his struggles to reach success. The film is a musical masterpiece. Prince's performance was spectacular. The direction from Albert Magnoli was great. The screenplay from Magnoli & William Blinn was excellent. And the soundtrack by Prince is one of the greatest soundtracks not just in film history, but in music history. It's still extremely shocking for me to believe that Prince is dead, even almost a month after his death. He was definitely one of the greatest musicians ever. And his legacy will live on. This was definitely part of that legacy. This was definitely an amazing film.